For those still wondering what is IRMA, let me introduce it. 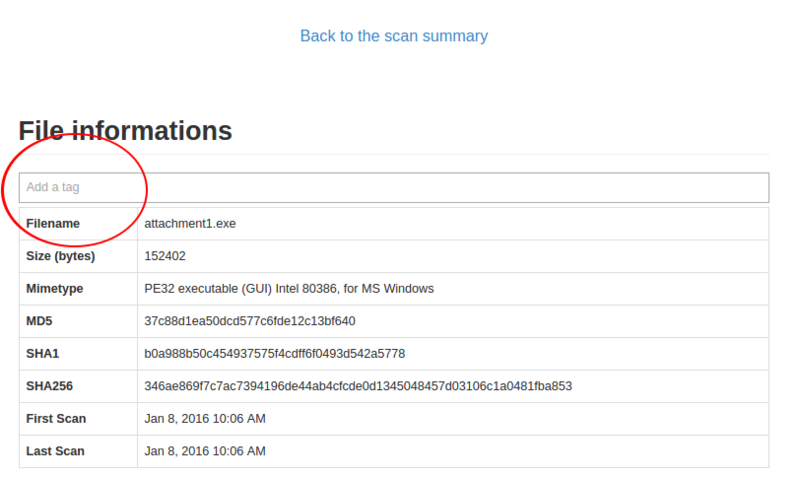 IRMA is an open-source malware analysis framework focusing on privacy so that submitted files are not shared with any 3rd party, but instead stay under your control. Each tool (e.g. antivirus, sandbox) able to perform a file analysis can be turned into an IRMA plugin (named probe). When a file is submitted to IRMA, it is sent to all running probes. Then, probe results are sent back and stored in a database and available through a WEB API. Every virtual machine running making IRMA runs on your hardware, and all files are kept locally. IRMA is built to be customized: adding a new probe, changing results view or displaying results content should be done quickly (for more information visit IRMA website). Before starting with the new features list, take a moment to download the virtual appliance (801 Mb) which will allow you to try these new features. Each feature is described from a user point of view (section User PoV ) but also explained with more details in case you want to use them as a contributor (section Contributor PoV ). Since v1.0, irma is shipped with a Python module to interact with the API. But all the API routes were not supported and there was no object deserialization nor documentation. A new repository, named irma-cli has been created to host our new command line module. The version numbering follows the API version supported. The table below provides a quick overview of the different IRMA releases with their respective versions for both API and irma-cli. As you noticed version 1.3.0 introduced a new API version but we have kept backward compatibility with the older version. Both API versions are available simultaneously. For more information on deserialized objects and fields meaning see the doc. Tags are a convenient way to easily classify files. Tagging a file is now possible in IRMA thanks to deloittem. Note: Creating a tag directly from the web IHM is not supported. Just click the tag bar and you will see all available tags. You could add multiple tags per file. One of the most important new feature in version 1.3.0 is called the scheduler. It makes it possible to schedule the analysis based on the files mime type. When a file is submitted to the frontend, its mime type is extracted with python-magic. Before the scan launch, each mime type is sent to the brain to receive the corresponding probe list that supports this mime type to avoid format error. No need to submit a PDF file to a PE Static analysis probe for example. This behavior is enabled by default through the WebUI and could be disabled only in command line mode for the time being. If you are interested in developing your own probe, the complete guide written by kamino is still working. The only thing to add is a regular expression to define the mime type that your probe supports. The second feature introduced by Scheduler is the ability for a probe to output files and send them for analysis to the frontend. To illustrate this new feature, irma 1.3.0 is now shipped with an unarchiver probe. 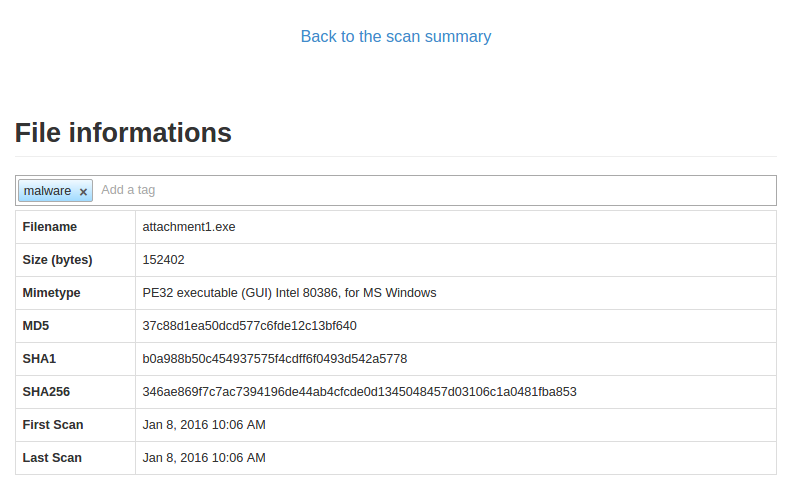 All files inside an archive are extracted and submitted to the frontend for analysis. Let's submit an archive through the WebUI. As soon as the unarchiver probe finishes, the children files are linked to the archive and their analysis starts. the code running in the main celery task file uploads them and adds an extra key to alert the frontend of new files available. We hope this new feature tour of version 1.3.0 has convinced you to give it a try as a user or as a contributor. In any case if you need help, you could reach us on IRC #qb_irma @freenode, see you there!